An artist’s perspective of the new airport terminal ... will set an environmental benchmark. Despite low oil prices, Kuwait is pressing ahead with ambitious projects to diversify its economy and is wooing investors to partake in the country’s development. A new investment law is expected to be instrumental in boosting private sector participation in the economy and giving the much-needed push to Kuwait’s ambitious infrastructure development programme, which over the next five years will see the execution of over 500 key projects. The country has set aside a whopping $116 billion to support large projects such as 45,000 new housing units, a metro and railway system, and a refinery, which are part of a five-year development plan that began in April this year, BMI (Business Monitor International) says in its fourth quarter report on the country’s infrastructure. Despite a slack business environment, which the foreign direct investment (FDI) law – the Direct Investment Promotion Law – aims to correct, Kuwait’s aspiration to diversify its economy from an over-reliance on oil revenue bodes well for the infrastructure and construction industries over the coming years, said the report. The law is expected to address fundamental flaws in the system and reduce red tape, paving the way for large companies to be formed quickly via a new unit – the Kuwait Direct Investment Promotion Authority (KDIPA). Private sector participation and favourable business and political environment are key to reinvigorating Kuwait’s infrastructure growth. According to BMI, independent water and projects (IWPPs) will continue to be a source of growth and could act as model over leveraging in the private sector into infrastructure projects. The country is expected to plough through the 2015 to 2020 development plan with increased government spending along with renewed private investment. However, the 2015-2016 budget earmarked at KD19.1 billion ($63.8 billion), 18 per cent lower on the previous fiscal year, is apparently confirming earlier reports of spending cuts due to pressures from lower oil prices, says BMI. Oil prices will strain investment in the broader economy, but the government’s investment in the infrastructure sector should remain relatively robust, it adds. 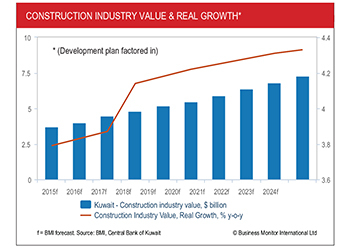 BMI anticipates that the construction industry will grow 3.8 per cent in real terms, below the 10-year average forecast of 4.1 per cent, adding that growth in the sector will pick up beyond 2016 as Kuwait implements an impressive project pipeline. However, there has been a perceptible improvement in the construction market with the third quarter having seen a remarkable number of contracts awarded, including the new Kuwait International Airport terminal, the new refinery at Al Zour, as well as over a $1 billion worth of road upgrades in southern Kuwait. According to an Arab Times report, the total value of projects awarded in Kuwait in 2015 climbed to KD9 billion ($30 billion) by the end of the third quarter. The report, quoting MEED Projects, says the total value of the country’s projects market (planned and active) grew to over KD74.3 billion ($246 billion) by the end of September 2015. Among the key beneficiaries in Kuwait’s development plans over the past year undoubtedly has been the oil sector which has seen key projects such as the $12-billion clean fuels project to upgrade refineries having been awarded, in addition to the new Al Zour refinery. Against this backdrop, Kuwait has lined up some of the major projects which are expected to be implemented between 2015 and 2020. These include the much-anticipated $17-billion railway and metro projects, work on which is expected to be unrolled over the next couple of years. The government is investing around $6.2 billion in a series of road construction projects stretching approximately 550 km. These include the $875.8-million Jahra Road development, which is one of the largest elevated road projects in the world (see separate report); and the $789-million Jamal Abdul Nasser Street development, which aims to transform the existing street into a world-class expressway (see separate report). Other major projects under way include the 37.5-km Subiya causeway, known as the Sheikh Jaber Al Ahmed Al Sabah bridge. The project consists of two parts. The first is the main causeway linking the Shuwaikh Port and the Subiya New Town area to the north. The second, which comprises the 12-km Doha link connecting Shuwaikh Port with the Doha motorway, was awarded to GS Engineering & Construction under a $532-million deal. The foundation stone for the Doha link was laid in April. The Kuwait Authority for Partnership Projects (KAPP) expects to start procurement on the $7-billion Kuwait City metro in the first quarter of next year. The 160-km Metropolitan Rapid Transit System Project (KMRT) with three lines and 61 stations is to be built in five phases. A 23.7-km line will run from Salwa to Kuwait University and will have 19 stations. Another 21-km line will run from Hawally, stopping at 27 stations and will end in Kuwait City. A third line will run 24 km from Kuwait International Airport to Abdullah Al Mubarak area and will pass via 15 stations. Procurement for the estimated $10-billion national rail network is also due to begin in the first quarter of 2016. The rail network will stretch from the east to the west of the country and will link into the railway networks of neighbouring Saudi Arabia and Iraq. The government is currently prequalifying consultants for design work and construction is scheduled to start next year. Turkey’s Limak Holding and local construction firm Kharafi National won the bid in August to build the new terminal at Kuwait International Airport (KIA) at a proposed cost of KD1.312 billion ($4.35 billion). The consortium had an earlier more-expensive bid dismissed; the bid was KD74 million ($244 million) cheaper than the offer it submitted last November. Terminal Two is designed to set a new environmental benchmark for airport building. 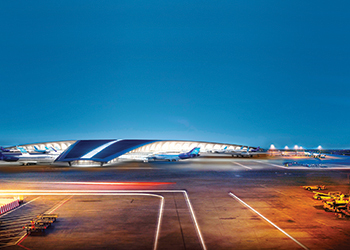 It will consist of three symmetrical wings of departure gates, each spanning 1.2 km as well as targeting Leadership in Energy and Environmental Design (Leed) Gold standard, making it the first passenger terminal in the world to achieve this standard. The country is also planning to invest $698.5 million in the redevelopment of the KIA and aims to increase the annual capacity of the airport to 20 million passengers. August was a key month for the power and water sector in Kuwait when the finance ministry gave approval for building a series of power plants, desalination facilities and other infrastructure projects worth a total of KD3 billion ($9.9 billion). The projects include construction of the second phase of the gas-fired Az Zour North IWPP that has an initial capacity of 1,800 MW, the first phase of the Khairan power plant with 1,500 MW of capacity and the Al Abdaliyah power plant with a capacity of 280 MW. Phase One of Al Zour North IWPP, Kuwait’s flagship PPP (public private partnership) project, is reported to be ahead of schedule. Meanwhile, South Korean firm GS Engineering & Construction has won a deal worth $306 million to build a water treatment plant for state-owned Kuwait Oil Company’s water centre project. The deal involves building water treatment facilities and pipelines in the North oil field, 90 km north of Kuwait City. The turnkey project is expected be completed by September 2018. Among other developments, KAPP announced the names of five consortiums that pre-qualified for the Umm Al Hayman Wastewater Treatment Plant in early October, with a main bid deadline expected in the first quarter of next year. The Public Authority for Housing (PAHW) is in a race against time to provide housing for 110,000 applicants on its waiting list. The largest project under way in northern Kuwait is Al Mutlaa City with 29,000 residential units, which is set for completion in 2018. Last October, the PAHW signed a KD46-million ($151 million) construction contract with Turkey’s Limak for infrastructure work in the West Abdullah Mubarak area that should see the creation of 5,200 residential units by October 2017. Meanwhile, the KAPP has revived the South Al Jahra Labour City project, which aims to house 20,000 workers. • Kuwaiti firm Tamdeen Group recently launched a $700-million mixed-use development, called Al Khiran, within the Sabah Al Ahmad Sea City project. The 350,000-sq-m project will comprise a 900-boat marina, a five-star hotel, a services apartment tower, two high-rise residential towers and a mall. The company has contracted RTKL to design the mall. The scheme is not expected to be tendered as Tamdeen will rely on existing relationships with preferred contractors to deliver the project. • Kuwait Projects Company (Kipco) is ready to fund construction of its planned $5-billion real estate project in Kuwait, but is open to bringing in partners to help speed up completion. The 380,000-sq-m development on the edge of Kuwait City, was among the largest real estate projects ever planned in the country when announced in September. Construction is expected to being early next year once municipality approvals are secured. • Hyatt Hotels Corporation’s affiliate has entered into a contract with Tamdeen Group for a 261-room hotel in Kuwait. Grand Hyatt Kuwait will be designed by RTKL Architects, which also designed the existing 360 Mall. Expected to open in 2020, the hotel will be an integral part of the mall, an iconic luxury shopping destination that integrates retail, leisure and entertainment under one roof that will include a world-class tennis complex (see Regional News). • Kuwait’s government has issued a request for qualifications (RFQ) to develop a new solid waste project over a 500,000-sq-m area in the Kabd region, which will be developed in conjunction with the Partnerships Technical Bureau and the Kuwait Municipality. The scope of the 3,275 tonnes-per-day waste-to-energy project involves the design, construction, financing, operation and transfer of a facility, which will treat municipal solid waste using a waste-to-energy technology to generate electricity. Construction is expected to take about four years to complete.